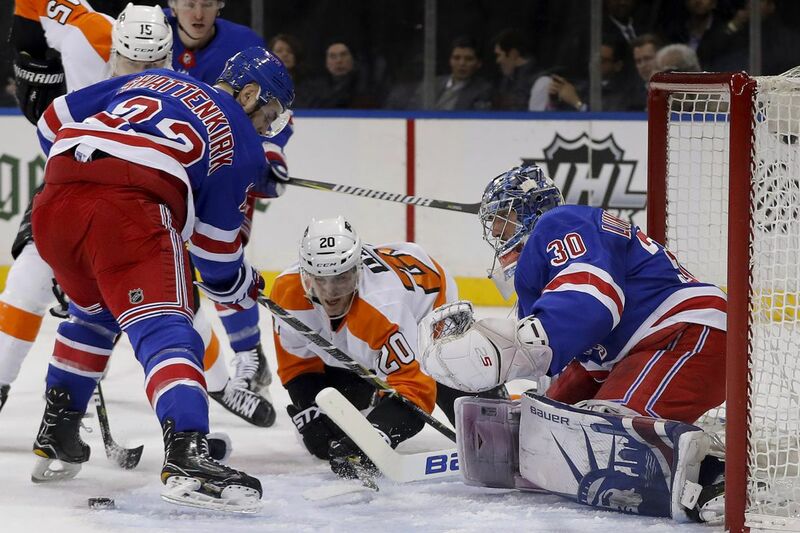 Rangers defenseman Kevin Shattenkirk (22) and Flyers winger Taylor Leier (20) look for the rebound as goaltender Henrik Lundqvist) defends the goal during New York’s 5-1 win on Jan. 16. The Flyers are maturing right before our eyes. Early in the season, they had a knack for losing close games and seemed to fall apart when they allowed a late goal. Over the last two-plus months, however, they have played with much more poise, much more resolve. That explains why they have won their last six games that have been decided in overtime, including Friday's 2-1 victory in Columbus. In addition, they are 6-3 in one-goal decisions since the calendar turned to 2018 — after starting the season 2-10 in one-goal games. "I think we're more and more comfortable in these games," coach Dave Hakstol said after the Flyers raised their record to 21-8-3 since they ended a 10-game losing streak in early December. "We've won a lot of these games, and our guys stay with it." Even a game-tying goal by Cam Atkinson with 3 minutes, 28 seconds left in regulation didn't cause the Flyers to panic. Instead, they regrouped and had several quality scoring chances — none better than a close shot by elusive right winger Travis Konecny, one of the young players who has blossomed — before the game went into overtime. "Great team effort," said goalie Michal Neuvith, who made 35 saves and has a 3-0-1 record since Brian Elliott went down with a core-muscle injury that will sideline him for at least five weeks. "The guys played unbelievable in front of me." The Flyers kept most of Columbus' shots from the perimeter, helping them extend their points streak to seven games (5-0-2). On Sunday, they play the New York Rangers in a noon matinee at Madison Square Garden. The Blueshirts manhandled the Flyers, 5-1, on Jan. 16. In that game, Elliott allowed five goals on 21 shots and was replaced by Neuvirth at the start of the third period. Neuvirth stopped all eight shots he faced. The Rangers are in danger of missing the playoffs and are in sell mode as the Feb. 26 trade deadline approaches. New York's ownership recently sent a letter to season-ticket holders, implying a major fire sale was coming. The letter said the Rangers "will be focused on adding young, competitive players that combine speed, skill, and character" and that "this may mean we lose some familiar faces." Wingers Rick Nash, Michael Grabner, and defenseman Ryan McDonagh probably have their bags packed. Because of injuries and poor play, the Rangers have been using a young, patchwork defense that has included Tony DeAngelo, 22, a native of Sewell, N.J.
Greg Smyth, 51, a former Flyers defenseman known for his physical play, died Friday after a long battle with cancer, according to the team's alumni association…..In Friday's win, the Flyers did not allow any power plays for the first time this season…..Nash had two goals in the Rangers' win over the Flyers last month, and defenseman Marc Staal was plus-4. Staal has been sidelined with a cervical strain…..Based on minutes played recently, the Val Filppula line has supplanted the Scott Laughton unit as the Flyers' third line….In addition to Sunday's meeting, the Flyers will face the Rangers on March 22 and in the season finale April 7, both at the Wells Fargo Center.